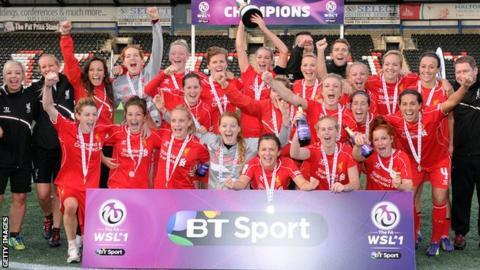 Champions Liverpool Ladies will host newcomers Sunderland in the opening game of the Women's Super League 2015. The Reds retained their title by finishing above Chelsea on goal difference, while the Lady Black Cats finished top of the second tier by two points to secure promotion. They will meet on Wednesday, 25 March, with the remaining opening-round WSL fixtures scheduled throughout the week. Relegated Everton begin life in WSL2 against Aston Villa on 18 March. The leagues will take a mid-season break for the Women's World Cup in Canada, which runs from 6 June until 5 July, and the Continental Cup will start in the second half of the campaign. With the WSL1 set to expand to nine teams for the 2016 season, two clubs will be promoted from the second tier in October, while only one team will be relegated from the top flight.